The driver of the truck, a 46 year old man from New Jersey, was carrying 13 275 gallon containers that were filled with the water based chemical. 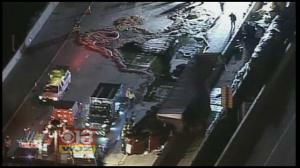 The chemical and the gallons of spilled diesel fuel were washed from the roadways before they were reopened to traffic. The Maryland Department of Environment gave the all clear after the 7 hour cleanup. The accident did not result in any injuries to other motorists and the driver did not suffer any serious injuries. Police spokesmen acknowledged that the accident could have been much worse if one of the 275 gallon barrels had fallen directly on a traveling car. Police also stated that the chemical could be washed off cars without causing damage, but motorists were warned to clean off their cars before the chemical dried. Once dry, the chemical apparently could stain and damage vehicles much like paint. In addition to facing criminal charges, the accident may also have civil lawsuit ramifications for the driver and his trucking company. Motorists who’s vehicles have been damaged by the spill may have to sue the trucking company in order to recover the cost of the damages. The motorists or their insurance companies may also choose to sue the driver directly if the trucking company claims that the driver was not acting within the scope of his employment when he decided to drink alcohol and drive. As per usual circumstances the criminal case will likely be disposed before any civil lawsuits are filed. 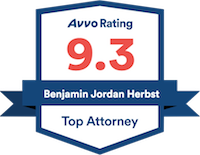 Benjamin Herbst is an experienced Maryland DUI lawyer, who has represented hundreds of clients charged with DUI. For a free consultation about your Maryland DUI case contact The Herbst Firm for a free consultation.